Not every homeless person is a drug addict or alcoholic as what some people may imagine. Some of them are actually trying their best to get a job and not panhandle, just like one man in Alameda County who didn’t have an ID. Alameda County Sheriff’s Deputy Jacob Swalwell had seen and warned Michael Myers, a then-67-year-old panhandler, many times. On Nov. 2, 2017, Swalwell decided to pull over with the intention of giving Myers a citation for panhandling. But things took an unexpected turn when Swalwell asked Myers for his ID—Myers didn’t have one. “Got to know him pretty quickly, and realized that a citation’s not what this man needs,” Swalwell told KGO. Myers has been a lifelong resident of the county, and had been a truck driver until a car accident left him disabled. 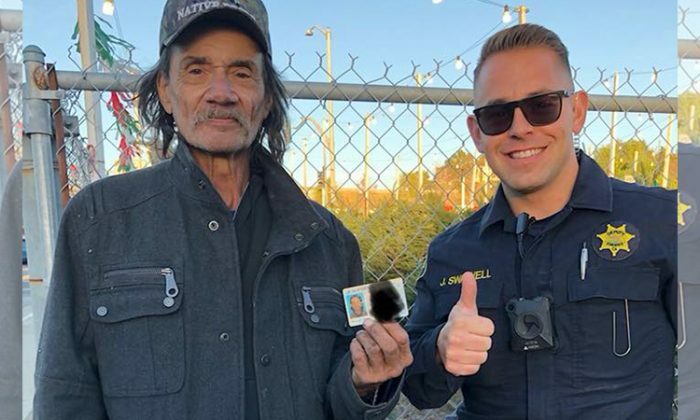 “Life hasn’t always been easy for him and when you don’t have an official birth certificate or identification card it can be hard to get a job or bank account,” the sheriff’s office wrote on their Facebook page. Swalwell decided to help Myers get an ID card to get him off the streets, but the path to getting it was not easy. Myers needed a birth certificate and two separate official documents that proved his residency. Swalwell first helped Myers obtain a copy of his birth certificate, and that’s when Myers learned that his real first name was Gordon, and the name Michael was his middle one. But when both of them got to the DMV, the request was denied because the law enforcement documentation was rejected. DMV suggested that they contact a local church that had authority to draft a letter stating on Myers’s behalf that he was a California resident. Finally, DMV accepted after Swalwell obtained a formal letter from Valley Bible Church in Pleasanton, along with a letter with an official letterhead that Swalwell wrote, stating that Myers was a Hayward resident. “Michael is now the proud new owner of a California Senior Citizen ID card,” the Facebook post read. Mick with his new guitar courtesy of Deputy Swalwell. For many years, many had ignored Myers until Swalwell took an interest in him and changed his life. In March 2018, Myers reconnected with his birth mom, Polly, for the first time in 67 years. According to CBS local, The Deputy Sheriff’s Association of Alameda County was so moved by Myers’s story that they wanted to help him. Thus they set up a campaign to raise money to help Myers and others experiencing homelessness. The money raised through the campaign will help pay for food, clothes, housing, education, and treatment. Myers also applied for social security. “Imagine how many others like Michael just need a tiny bit of help, someone to care and take notice,” the post concluded.